Valve Files Trademark for ... DotA? 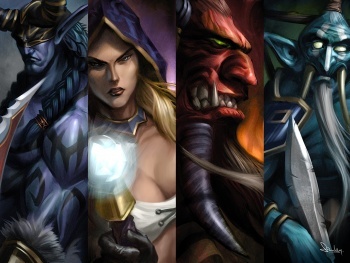 Popular PC developer Valve has registered a trademark for what is apparently popular Warcraft III mod Defense of the Ancients. If you've never played Defense of the Ancients, it's a wildly popular custom game built using the Warcraft III map editor in which players control a single hero (rather than an army) in a team battle to destroy the other team's base. I also question why you clicked on this news piece in the first place, but that's beside the point. "Had a great time in Seattle last week recording for DotA. The guys at ValveSoftware are awesome! Going to PAX? Might see you there - Sept3-5"
Now, Valve has filed a trademark for something called "DOTA." While none of this is absolute concrete evidence that Valve is working on its own DotA clone - to join the ranks of League of Legends, Heroes of Newerth and Demigod - it's more than enough to make one wonder. Ah, maybe it'll just be a TF2 mod. While DOTA is immediately recognizable to anyone who's ever played the original game, might I suggest some other alternate titles: GLeague of GLaDOS? Heroes of Newell? Demigordon, perhaps?